Use the form on the right to contact us or contact us directly via email or phone. The wedding rings are one of the most long lasting and meaningful elements in a marriage - it’s the eternal symbol of love! As alianças são um dos elementos mais duradouros e com maior significado no casamento - é o eterno símbolo do amor! The “Couples Experience” it’s an unique experience full of symbolism, where you can make your own wedding rings in our studio, with the help of our professionals. 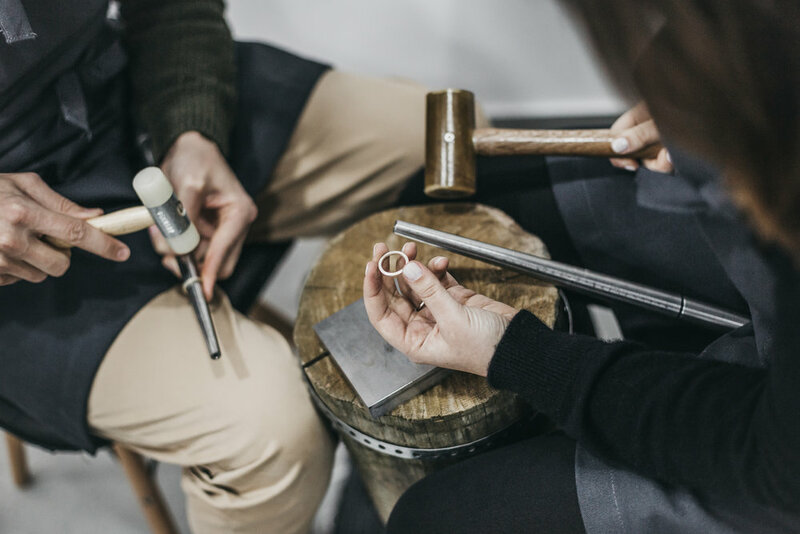 After an initial meeting, where we get to know more about your story and which materials and design you prefer, you will handmade and participate in the making processes of your wedding bands - all from traditional and handmade processes, from start to finish. O “Couples Experience” consiste numa experiência única cheia de simbolismo, onde os casais fazem as suas próprias alianças de casamento no nosso estúdio, com a ajuda dos nossos profissionais. Depois de uma reunião inicial, onde ficamos a conhecer o casal e que modelo e materais gostariam, o casal produz e participa em todas as etapas da produção das suas alianças - tudo a partir de processos tradicionais e manuais, do início ao fim. * Please book in advance your “Couples Experience”. * Marque com antecedência a sua “Couples Experience”.